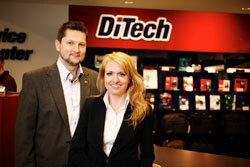 Viennese hardware computer trader DiTech has slipped into insolvency. The Vienna-based electronic dealer has undertaken too much by a fast expansion and has now declared insolvency. Within this week, the enterprise intends to file for reorganization proceedings at the Commercial Court in Vienna. According to founder of DiTech and general manager Damian Izdebski, the number of employees is supposed to be cut by 60 to 80 persons.